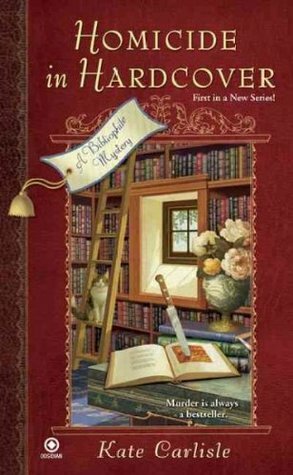 Homicide in Hardcover is a cute, quirky start to a mystery series. This isn't a cozy about a bookshop owner, but a book restorer who repairs valuable tombs that have degraded with age and abuse. It opens with a touching scene where she reunites with her mentor, her friend, only to find him brutally murdered moments later. Her internal monologue and family left me giggling, giving the series needed humor as it breaks between the tragedy of the murder. I loved the protagonist's quick wit and comebacks, her sarcasm in relationships and life beliefs, her introverted personality and work obsessed personality. The far out new age family and circle is a fun accompaniment. The writing style is a winner. The mystery side is decent - there's some worthy misdirecting, a little actual investigating, and of course tricky tangling with some colorful detectives. It wasn't obvious who the murderer was, but the villain made sense in the end when the veil is lifted away. There's a tense scene or two that made the book hard to put down, but overall this is a rather sedate mystery pace. Despite humor and quirk, the book balances the subject of murder and investigating evenly enough. I think I'll like the series, but the book didn't engross me yet. I'm thinking the next, especially considering how fun the characters are, will do the trick. I hope so since I bought the next three books already. Maybe a risky gamble, but how can a book-lover and mystery lover resists a bibliophile mystery series?